SSR LLC – Akzo – Time for a New Game! – Problem or Opportunity for PPG? We are surprised to see Elliot expand its ownership of Akzo and would have expected the fund manager to fold up its tent and move on after the events of the last few weeks – the “long game” here is harder to understand. It is highly unlikely that Elliot has increased its stake because it suddenly believes in the Akzo “go-forward” plan, given that only a couple of weeks ago the company was in court trying to get a shareholder meeting convened with the goal of ousting the Chairman. Elliot is not only up against a hostile and uncooperative company, it is also up against an equally hostile country, one of the reasons we believe that PPG did not make a hostile bid. The company and country attitude is not going to change, even if Elliot attracts more like-minded investors into the stock – shareholders do not come first in the Netherlands. It is our view that Elliot may not succeed in bringing about change without significant help from Akzo and the company must believe strongly that it will get that help. 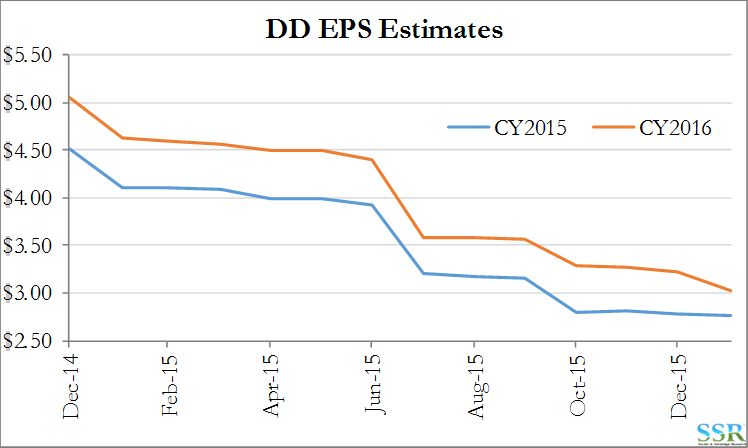 Akzo is going to have to fail – miss targets – underwhelm – see DD timeline below. 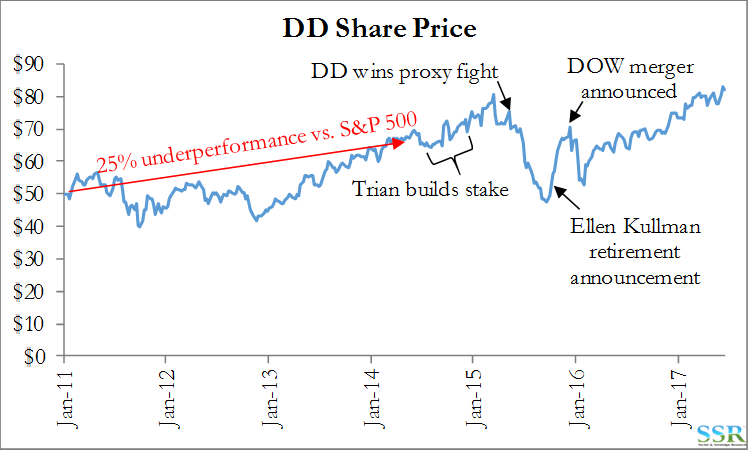 Trian won at DuPont, eventually, in part because it was relentless, but largely because DuPont kept missing expectations. Similar stories have unfolded at APD and now GE. To defend against the shareholder vote, DuPont did what Akzo did recently – laid out an ambitious “leave me alone” plan. While DuPont won the vote, it almost immediately began to fail against its own objectives, repeating a pattern of the prior few years. Old DuPont was very much like current Akzo; overconfidence based on an overly optimistic view of its products, pricing power etc. and the extreme edge of that optimism drove the defense against the activist – setting targets and expectations that were out of reach. But… Trian had a board of directors that paid attention – all evidence suggests that the Akzo board is fiercely loyal to its management team – even if Akzo misses objectives and even if Elliot has other shareholder support, we are unclear with respect to the end-game. 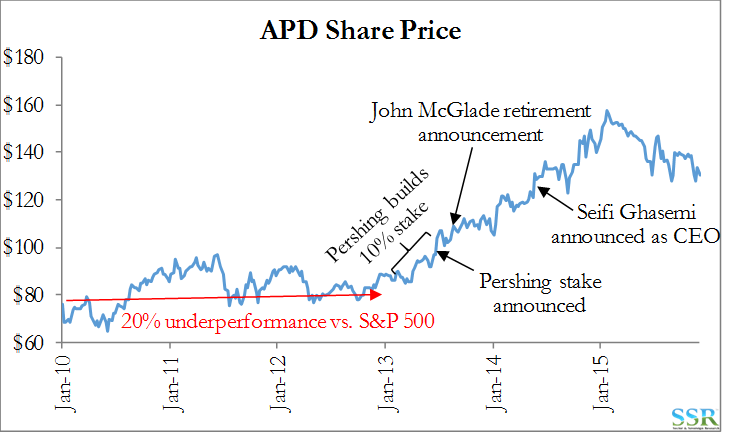 This leaves both current shareholders and PPG in uncertain territory. Should shareholders stick around because there might be more to the story, but running the risk that Akzo misses targets quickly and the stock weakens? If you are PPG – do you wait? Also risky; if there are other acquisitions in the pipeline; alternatives that might make an Akzo deal harder from a regulatory review. We are more positive on PPG than Akzo, but it’s unlike Elliot not to have a plan – even if we cannot see it – this make us a less aggressive seller of Akzo. 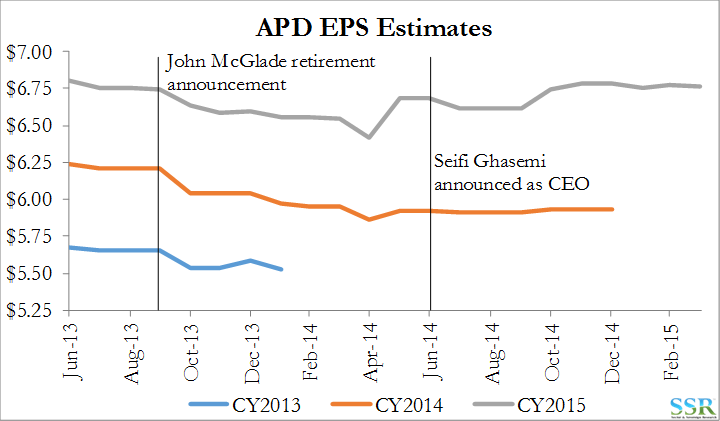 The DuPont timeline is plotted against the share price in Exhibit 2. The underperformance attracted Trian, but so did the cost base, which Trian thought was bloated – a view we had shared for many years. Trian’s willingness to stick around following the lost proxy vote paid off, but there was some immediate pain following the lost proxy vote, not just because of the vote but because DuPont almost immediately missed objectives. Note that part of the drop in value prior to the CEO exit was the separation of Chemours, but most of it was sentiment driven – both DD and Chemours (which underperformed dramatically post spin). 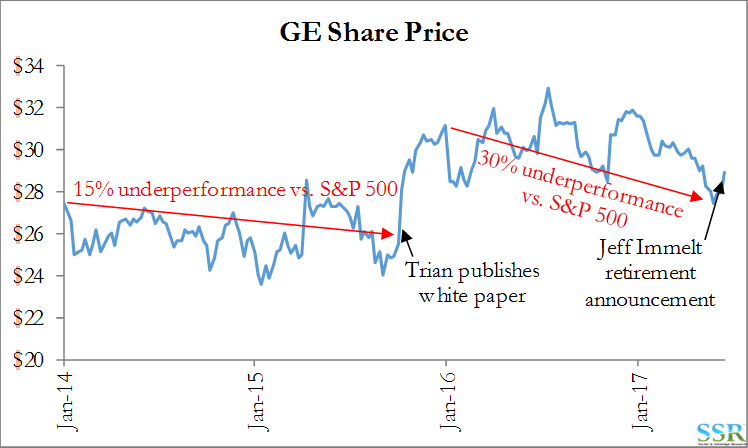 DuPont’s estimate revisions are summarized in Exhibit 3 – in our view, DuPont’s CEO overconfidence, which drove these earnings misses, gave the board no choice but to pay attention to the accurate criticism brought by Trian. Air Products, in our view, was a little more straightforward as the company knew things were not going well before Pershing took a stake – capital had been allocated sub-optimally and the company was missing targets – another optimist. Unlike DuPont, the Air Products CEO was willing to concede that it was time for someone else to “have a go”. As an outsider, Seifi was able to take a cold and unemotional look at costs (as did Ed Breen at DuPont) and was able to implement immediate change. The annotated stock chart is shown in Exhibit 4 and the revisions chart in Exhibit 5. 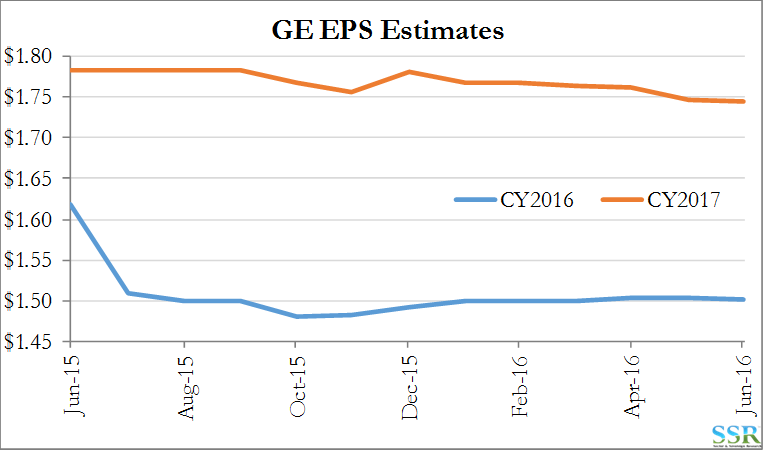 GE is a more recent example and a company we have written on extensively this year given that it is an underperforming company that is, consequently, a true champion of our work on both the perils of complexity and corporate optimism – more similar to DD than APD. The CEO exit is in the works after years of underperformance and after patient constructive dialogue with Trian (again). While the revisions chart looks less interesting today, we would anticipate some house cleaning with the change of leadership and at least one more step down from here before things start to improve – Exhibits 6 and 7. Akzo has not seen the share price collapse following the failed PPG bid that DuPont did following the proxy vote – Exhibit 8. But this is perhaps because the company has seen improving business trends – Exhibit 9. 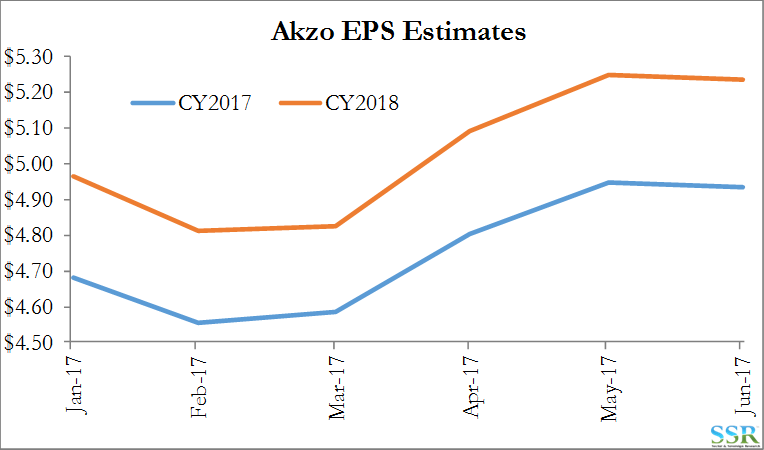 While Akzo holds the ranks of one of the most optimistic over the longer-term – see prior research – the company has been more conservative for the last couple of years and the business is on an improving trend. This fits with one argument we heard a lot, which is that PPG was being opportunistic – trying to buy an improving business trend before the equity value of the company adequately reflected that trend – estimates have been going up rather than down, though some of that is a result of revised company projections in April. It is possible that Elliot simply believes the new Akzo plan and that the company is staying in the stock and increasing its stake because of that. We think that is unlikely as the plan seems to us to be too ambitious – relying on stronger underlying market growth than we have seen in the past, suggesting that the company can grow share and at the same time expand margins – i.e. grow share without losing pricing. Our thoughts on the key elements of the plan are summarized in Exhibit 10. In conclusion, Akzo has been able to deliver over the last 18 months because the company has set a relatively low and achievable bar. What is laid out in Exhibit 10 is not a low bar. And here is where we get stuck! We don’t believe that Akzo can make its aggressive targets – so either they get dialed back or the company disappoints. While in the US this would likely play into the hands of an activist shareholder who is chipping away at the board of directors – what happens in the Netherlands where no-one seems to care? For this to work for Elliot, Elliot must believe that it can attract more like minded investors into the stock and PPG has to be willing to wait 6 months to make a hostile bid when there is a friendlier shareholder base. Or perhaps Elliot is hoping that a waiting game will attract more than one interesting bidder for Akzo within 12 months and that one way or another this company is going to be bought.